Clemson, SC – Clemson Head Football Coach Tommy Bowden has agreed to a new contract addendum, Director of Athletics Bobby Robinson announced Friday afternoon. 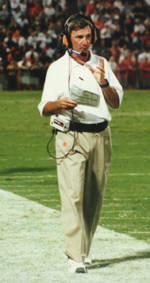 Bowden’s contract now extends through the 2007 football season. The addendum calls for Bowden to receive a financial package worth a minimum of $ 1.1 million per year, with potential value approaching $ 1.4 million per year. The potential to earn additional income is based on the number of regular season victories and/or performance in post season play. The compensation package is funded through revenues generated by the athletic department, as well as external compensation from radio/TV, endorsements and speaking engagements. An overview of the contract addendum between Tommy Bowden and Clemson University is attached to this release. CONTRACT TERMINATIONTERMINATION WITHOUT CAUSE BY UNIVERSITY If the University terminates Coach Bowden without cause, the University would fulfill the following buyout schedule.